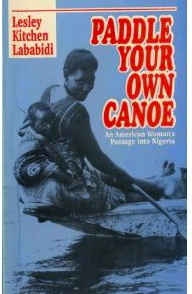 Paddle Your Own Canoe: An American Woman’s Passage into Nigeria (Spectrum Books, 1997) sets forth a narrative, a firsthand experience of a young woman who left America to marry a Muslim in Lebanon and to settle in Nigeria, after a brief sojourn in Ghana. With drama, humor, vulnerability, and courage, her life unfolds in a mixed marriage that crosses racial, religious, and linguistic frontiers. She and her intrepid husband face daunting challenges to build a life for their family in Nigeria. The stories are people-centered, and we can see and feel experiences of human sensitivities, diversity, hardships, poverty, and empathy. There is Salah, a Palestinian, who takes Lesley under his wing and Joseph, an Igbo cook, who died in Lesley’s arms. Then there is Alhaji Abdu, a Hausa – a scoundrel and guardian angel, who protected the family and house on the Street of Kofo Abayomi. To read a review of the book on Amazon, click here.